Metropolitan’s MetroGreen energy-independent facility features the latest advancements in Green technology. At Metropolitan we’ve always said we’re committed to developing “Green” technologies, but nothing demonstrates this dedication more than our MetroGreen energy-independent facility. Located on-site at our headquarters in Romeoville, Ill., MetroGreen serves as a facility where both Metropolitan employees and visitors can learn basic and advanced concepts of Green technologies. Rainwater harvesting system: Water from the gutter system fills a 1500-gallon harvest tank needed for storage. A booster pump runs on either AC power or solar power depending on the homeowner’s preference. The system also includes a filter system, which removes 99.9 percent of contaminants before entering MetroGreen. Solar and/or wind powered water well: Water well operates by using either wind or solar power, completely off the electric grid. Water well is only used when rainwater is not available. • Step one: Waste moves through trash tank for removal of any non-biodegradable materials. • Step two: Tank allows for 3.5 CFM of diffused air that promotes the growth of aerobic bacteria that breaks down waste. • Step three: Pump tanks to drip irrigation system located in field for release – drip line allows ½ gallons per hour into soil about 8 inches to 10 inches below the surface. The wastewater treatment system feeds directly into the drip irrigation system. Solar heating system: Solar bulbs turn sunlight into usable energy to heat water. Solar system heats water tank for distribution to fixtures and radiant floor heating system, if needed. Standby natural gas boiler: Backup system for radiant flooring and domestic hot water heater. Boiler is high-efficiency, condensing-type and provides supplemental heat to solar system. Automatic charging sink and fixture: When motion is sensed, sink will run and automatically charge battery that runs the motion sensor. Sink saves hundreds of gallons of water per year. Water-saving toilet uses less than 1.6 gallons of water per flush. Sump and Sewage Backup System: Powered by SUMPRO® backup system. In addition to these products, we have recently added new features MetroGreen, including a solar-heated hot tub, LED lighting and products from our Ion|StormPro® product line. Harned said the recent addition of products reflects the changing nature of the Green market and that alternations will continue to be made to MetroGreen as new technologies are introduced. While this development has been a monumental commitment for Metropolitan, it has given our employees a plethora of knowledge of Green products to work with, allowing us to expand our product base and expertise into new areas to better serve our customer partners. The other primary beneficiaries have been our customer partners and visitors. Full tours of our MetroGreen energy-independent facility will be available during our Open House on October 11, 2012. For more information regarding MetroGreen, facility tours and Metropolitan’s Green products, please contact 815-886-9200 or sales@metropolitanind.com. Metropolitan Industries recently assisted in the upgrade of several existing lift station control systems for the City of Rock Falls, Ill. Metropolitan municipal salesperson Dan Howorth was on-hand to see the last of the six lift stations improved begin operation. Included within the systems are Multitrode level probes with new PLCs, including Trihedral’s VT SCADA software. This technology gives the city the ability to monitor each system on a station-by-station basis at a cost-efficient price. Metropolitan was first contacted by the consulting engineering firm Willett Hofmann & Associates, Inc. of Dixon, Ill. for design assistance. For a relatively small city such as Rock Falls, the integration of this type of control system in its lift stations made ideal sense. For municipalities that generally do not utilize a full SCADA system, the panels Metropolitan provides can operate independently or as part of a complete SCADA system. Another benefit of these systems is flexibility. Though the city of Rock Falls will begin operation of each station independent of any SCADA communication, these systems are SCADA compatible if customers wish to employ them into a more comprehensive SCADA system in the future. The city of Rock Falls has chosen to activate each unit using VT SCADA capabilities, but had previously developed a large wastewater plant and can now connect each lifting station to a city-wide SCADA system if they eventually choose to do so. For more information, please contact Dan Howorth at 815-886-9200, ext. 281 or sales@metropolitanind.com. Continuing our residential flood control series, the name SUMPRO® has been synonymous with dependability for over 20 years. UL recognized and a favorite among contractors, plumbers and homeowners around the country, the SUMPRO® battery backup system is the premier fully-automatic auxiliary power source available. Performance tested for optimal functionality, SUMPRO® systems can be used in conjunction with pumps of the published horsepower ratings. SUMPRO® systems install in minutes as users simply plug units into a standard wall outlet. Once detected, SUMPRO® will continue to use utility power until a power failure is detected. When a power failure is detected, SUMPRO® will instantaneously begin to supply standard household electricity to any connected appliances. Once utility power is restored, SUMPRO® automatically switches your appliance back to utility power and immediately begins to recharge its internal batteries in anticipation of the next power failure. The typical installation of a SUMPRO® battery backup system. SUMPRO® has input levels of 60 Hz, 120 VAC and 12 AMP, and output levels of 120 VAC and 15 AMP at a .80 service factor. Units can be shipped anywhere and come with a full one-year guarantee. For premier performance, SUMPRO® can be combined with Metropolitan’s maintenance-free AGM Power+ batteries. By adding an extra set of Power+ batteries, users can double or triple their run times. In addition to SUMPRO®, Metropolitan’s residential division offers full packages which include battery backup systems, pumps, float switches and pump controllers needed for complete flood protection. For more information regarding the SUMPRO® battery backup system and our residential division, please visit the official website of SUMPRO® or call 800-323-1665. A view of the renovated water pump station in Franklin Park, Ill.
At Metropolitan Industries, we pride ourselves on service that exceeds customer specifications. Over the years, we have modernized the fabrication process to complete projects that include even the most difficult of challenges. The Village of Franklin Park, Ill. recently made the decision to upgrade an existing pump station and contractor Dahme Mechanical Industries, Inc. of Arlington Heights, Ill. called upon Metropolitan to assist in addressing their needs. The facility was more than 40 years old and served as a main water pump station for the village. The project required specialized fabrication of certain parts to aid in installation of the new booster pumps. Following an initial field visit, Metropolitan Salesperson Ken Turnquist came to the conclusion that specially fabricated spools would be required for the project to function upon completion. To accommodate the village’s needs, Metropolitan’s Bob Svoboda designed several custom-dimensioned offset spools to ensure the new pumps would work in the existing configuration. In total, eight specially fabricated spools were required to complete the project. Turnquist says the need to specially fabricate a system is an opportunity Metropolitan faces on a routine basis. Lift station adapter flanges for rail systems are one of many special fabrications Metropolitan creates regularly. Metropolitan’s Fabrication Department designed eight offset spools for the upgrade. For more information, please contact Ken Turnquist at 815-886-9200, ext. 261 or sales@metropolitanind.com. Metropolitan’s Ion Genesis® smart sensing controller gives users control of all vital pumping options. The development of our Ion™ Digital Level Control float switch opened the door for the development of new products within the Ion product line including our user-programmable smart sensing controller, the Ion Genesis®. To put in the most simplistic terms possible, the Ion Genesis® is the most complete pump controller on the market, providing the most features and safeguards against the devastation of flooding. The Ion Genesis® comes complete with dual Ion™ Digital Level Control float switches which continuously diagnose and report real-time critical pumping information to the controller. 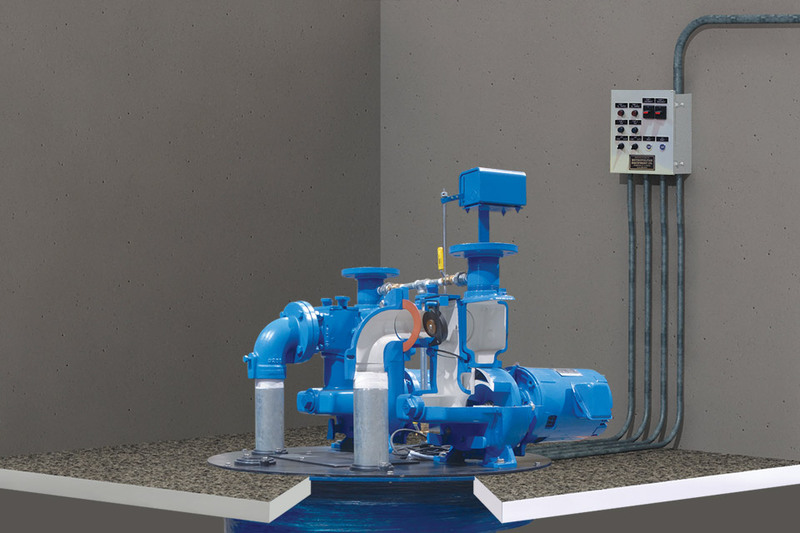 The controller itself gives users control of all vital aspects of pumping and efficiently cycles pumps to minimize pump turn-on cycles, ultimately adding life to the pump itself. Metropolitan Salesperson James Spurney said everything starts with Ion™ Digital Level Control float switches, which are used in place of standard float switches. These sensors are the most reliable on the market and incorporate no moving parts, which is associated with 98% of mechanical switch failures. Basic features include a high water alarm and easy installation, but Spurney contends the Ion Genesis’® advanced features of protecting against floods are what distinguishes itself from similar products on the market. Another unique feature of the Ion Genesis® is the ability for users to manually adjust the pumping level. The level can be adjusted from 2” to 24” in 0.5” increments using the controller without entering the pit. Spurney said this not only gives the product versatility, but can also extend the life of pumps as well. Installation of the Ion Genesis® involves no hard-wiring or complex programming and can be used in small or large volume sump pits. The combination of versatility, value and multiple fail safes make the Ion Genesis® the premier product in flood control. For more information regarding the Ion Genesis®, please contact 815-886-9200 or visit us on the web. The Wyndham Hotel of Lisle, Ill. is located just outside of Chicago and includes 242 rooms spread across eight floors. At Metropolitan Industries, we have the capability to bring the most up to date, energy efficient pump system to your commercial facility. Whether you require a retrofit substitution of a previous design or an entirely different pump system in general, Metropolitan has the experience, adaptability, and customer service to design and service the most complex commercial projects. A premier example of our commitment to delivering this type of system is demonstrated by the work done at the Wyndham Hotel of Lisle, Ill. Working with a constant speed system that was over 10 years old, the hotel turned to Metropolitan Industries to deliver a solution that would save in energy costs. Metropolitan replaced the existing system with a Metro-Varipac System 2100 Triplex Variable Speed Pump System designed to provide a flow rate of 600 GPM at a constant discharge pressure of 90 PSI. A total of three pumps were supplied, each designed to perform at 200 GPM at 115’ TDH. Each pump motor is rated at 15 HP, 3500 RPM, 60 Hz, 460 volt and three phase. Metropolitan’s Triplex Variable Speed Pump System will not only save the Wyndham Hotel funds in energy savings, it also freed up space for the hotel to utilize differently. Metropolitan’s Metro-Varipac systems are available with options including, but not limited to, touch screen control, stainless steel piping and hydropnuematic tanks. The smart pump technology incorporated by Metropolitan extends the life of the pump system. The compact packaged design allows for easy maintenance and gives customers the ability to place systems virtually anywhere. Variable speed controls can save customers thousands in energy savings and can virtually pay for the entire system over time. The compact design of the new triplex system not only allows for easier maintenance, but also saved a great deal of space for the hotel. With the installation of the new variable speed booster system, the hotel can expect an energy reduction of 30% to 40% in domestic water system operation. For more information, please contact Mike Ponx at 815-886-9200, etc. 265 or sales@metropolitanind.com.